Keep checking back for the updated 2019 kit. INFO BELOW IS FOR THE 2018 SHOW. CHECK BACK FOR THE UPDATED 2019 KIT. 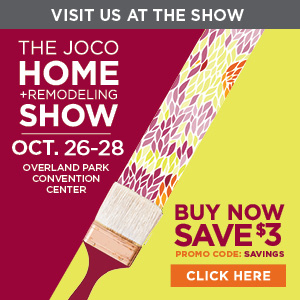 The JOCO Home + Remodel Show does not print or mail the Exhibitor Kit. All information can be found in the Exhibitor Manual and the links below. Create a new listing or update an active 2017 listing using the buttons below. Promote the show and YOURSELF on Social Media. We'd prefer if exhibitors did not make their own Facebook Event, but we'd love if you joined ours! We can make you a co-host, so our Facebook Event will appear on your Facebook Page. You can also share the Facebook Event regularly. You can post show specials and business information in our Facebook Event regularly. It's the best place to connect with our attendees prior to, during and after the show. Click Here to go to our Facebook Event for 2018. In addition to using our Facebook Event to your advantage, consider submitting an Exhibitor Spotlight. We'll use your answers to create a blog that will appear on our show website, and be shared on Twitter and in the Facebook Event. Click Here to fill out the Exhibitor Spotlight form. Move-in letters with a scheduled time for each exhibitor will be mailed in September 2018. *No vehicles will be allowed in the building until the carpet has been removed. *All Ballroom Booths must be removed by 11:59 pm Sunday, October 28th. Interested in getting your name out there? Donate Items for girls night out/Saturday Night Out at the KC Holiday Boutique. Friday, November 16th and Saturday November 17th from 5:00 pm. to 9:00 pm., Holiday Boutique turns a unique shopping experience into four hour parties with a special Girls Night Out on Friday & a Saturday Night Out on Saturday - complete with music, entertainment and fabulous door prizes! You can reach shoppers and gain more exposure at the show at both special events by providing a gift certificate from your business. Click Here for the form and to learn more. To purchase any of these services please visit the Overland Park Convention Center website or contact Exhibitor Services at 913.339.3000. Click the order form button below for complete details. For information regarding sales taxes prior to the event please visit the Kansas Department of Revenue Division of Taxation website. The Show Office on-site will also have sales tax packets available. Parking is free. The covered lot will be for exhibitors on a first come first serve basis.